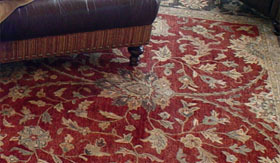 Ring in the New Year with a Fabulous rug! 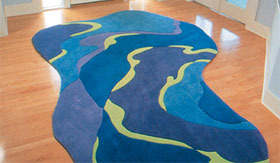 Multi-colored wool machine made and hand carved rug. The effort to find the perfect decorating addition for your home, while maintaining a tight budget can be both frustrating and very time consuming. When you know what you want you’ll go to great efforts to find it, even with the fear that you’ll find that perfect area rug and realize it’s beyond your reach. 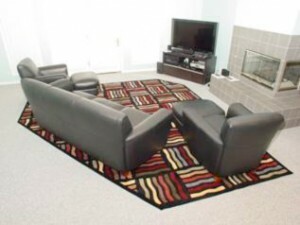 We had an Overland Park, Kansas couple come into our store looking for a very specific look in an area rug. Their family room was contemporary in style, featuring muted colors in the carpet, the drapes and on the walls. Their furniture was also contemporary with matching leather couch and chairs. The shape of the room meant that they could place their furniture in a unique way to feature the fireplace and entertainment center. The Staton’s were looking for something bold, to counter the muted colors of their room, but also a unique shape, that would allow them to place their furniture as they had planned. They were concerned though, that their search would necessitate ordering a custom rug, which would be well beyond what they could afford. Jon Popchoke, Designer with Area Rug Dimensions said, “When the Statons came into the store and explained what they were trying to do, I thought, now here’s a challenge that will be fun.” He came up with the idea of taking two premade rugs, cutting them to the perfect shape and sewing them together along a common seam. This resulted in a shape that was exactly what the Statons wanted and best of all, it saved them a lot of money. 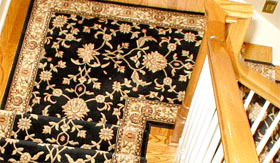 Better yet, they were able to get their rug in 6 weeks instead of 6 months! 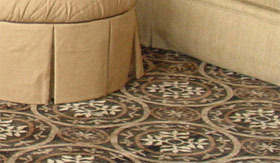 We love working with customers who have unique needs or particular wants, especially when finding that perfect area rug is a challenge. We can save a lot of time as well as helping to meet a budget. 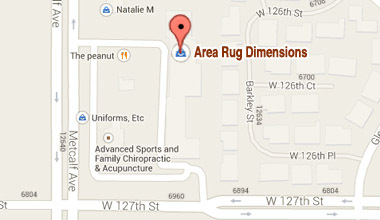 Contact Us at 913.327.8784 or come to our showroom at 127th & Metcalf in Overland Park, Kansas. Let us use our creativity for you.